Why is there a workers’ Esperanto movement? WHY IS THERE A WORKERS ’ ESPERANTO MOVEMENT ? The first remark many sceptics make about Esperanto is that it is not “useful” the way other, allegedly more “important” languages are. A politically left-leaning sceptic may wonder, if he or she learns of the existence of a worker’s Esperanto movement, what good it has ever been for workers, except possibly as a pastime. I will argue that Esperanto is more than that, and to that end I want to review a few of the reasons why progressive workers and others have chosen to learn and use Esperanto in the past and are still doing so. Esperanto – seen both as a language and a community of speakers – is basically a practical option for contacting people from other countries. It certainly isn’t the only one available, and the more options – languages and contacts – you have, the better. Despite its small number of users, Esperanto has some notable things going for it, one of them being that its speakers are to be found throughout the world and that they almost invariably enjoy having a wide variety of foreign contacts. Otherwise they wouldn’t have taken the trouble to learn it. Esperanto has been around since 1887, and it was in the first decade of the 20th century that increasing numbers of workers began to learn it and set up their own organizations that were independent of the bourgeois Esperanto movement that had coalesced a few years earlier. Around the same time Esperanto made its way to East Asia. The first to study it in China were anarchists who used it to contact European worker Esperantists. One of the motives for setting up a worldwide proletarian Esperanto organization in the 1920’s was that in the aftermath of the 1st World War, large numbers of mostly monolingual workers were actively seeking contact with fellow workers in other countries, and some of them found Esperanto to be the only language they could learn quickly and easily enough in their free time. The war had led them to conclude that the mutual isolation of the working classes of different countries had made it easier for the ruling class to manipulate them by means of nationalist ideology. It helped, of course, that there was at that time a large workers’ cultural movement associated with socialist, communist, anarchist and other leftist tendencies. It proved to be an ideal location for Esperanto activity. 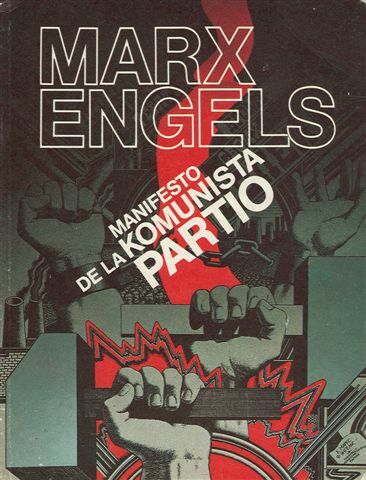 Communist parties, for example, promoted correspondence between workers in various countries, and Esperanto was used extensively for that purpose – before the era of Stalin, in which Esperantists were persecuted in the Soviet Union. The number of proletarian Esperantists grew quickly in the immediate aftermath of the war. Moreover, they were more loath than ever to organize within the established “politically neutral” (as it purported, and still purports, to be) Esperanto-movement. That movement had been deeply compromised in their eyes by the loyal support it had given to the war effort of various European nations. Some form of permanent workers’ Esperanto organization had become necessary. “Let members of SAT accustom themselves to extranational perception, thinking and activity”. SAT was not meant to usurp the role of political parties by engaging in political struggles directly, but was to be a cultural association engaged in workers’ education – one that would help to break down national and ethnic barriers between workers by involving them in practical collective activity. The membership of SAT peaked in the late 1920’s at around 6000, and has since declined to a little over 700. The reasons for the decline are manifold and it would require a lengthy excursion into history to deal with them here. Suffice to say that most of them relate to the history of the community of Esperanto-speakers and the troubles of the political left in general, though some of them stem from SAT’s own difficulties in maintaining a left-wing and antinationalist profile that clearly sets it apart from the bourgeois Esperanto movement, whose increasingly culturalistic, identitarian and even nationalist discourses now pervade the whole Esperanto-speaking community and even crop up in SAT sometimes. One thing that has reduced public interest in Esperanto is the perception that English is now doing the trick and filling the role that was once foreseen for Esperanto. Although many leftists see it that way too, I think they would do well to take a closer look at the matter. Even in Western Europe, where English has long been the pre-eminent foreign language taught in schools, and where economic conditions and geography favour international contacts and travel, most people don’t leave school with enough English to use it effectively for political purposes or to become personally close to the people they use it with. Esperanto – regardless of whether it has any chance of being “introduced” worldwide – helps to make up for this. The bourgeois education system produces hordes of educational losers who have lost confidence in their own ability to learn foreign languages (among other things), and Esperanto helps some of them to regain the confidence that they actually can learn languages. 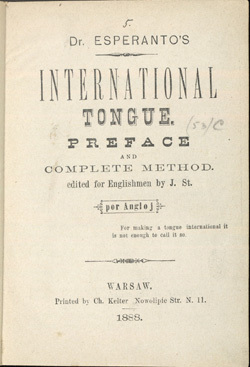 Esperanto induces its users to cultivate a general interest in languages, since many of its speakers concern themselves with linguistics and the sociology and politics of language. The Esperanto-speaking community does more than any other group I know of to stimulate its members to learn other languages, including “exotic” or less frequently studied ones. 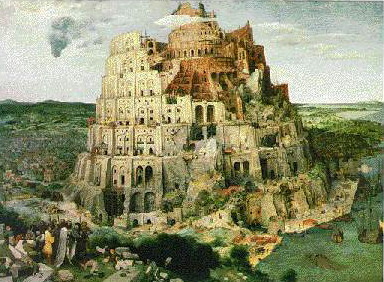 It is a great place to acquire translation skills together with other people who are usually cooperative and friendly. It is also not a bad exercise for monolingual English speakers in particular to put themselves in the place of people who are not usually or ever able to use their native language for international communication. Using a language that belongs to all its users equally, while being the native language of only few, is a way to do that. Esperanto speakers promote an ethic of equitable linguistic communication, addressing an issue of worldwide social inequality that most people never think about. Esperantists have a tradition of providing hospitality to travelling Esperantists from other countries, something that a lot of people that don’t have wads of money to spend on vacation travel make abundant use of (both ways, as guest and host). For some people, this alone is sufficient reason to learn Esperanto. Undeniably, some Esperantists are zealots who would have people believe Esperanto to be a panacea for international strife, cultural imperialism or other ills, but the number of zealots is declining. Though it hasn’t reached the point of being a schism, Esperantists are presently tending to drift into two groups. One of them insists on maintaining the stance of a “movement” and will clutch at any straw in order to preserve the hope that Esperanto can one day become the international language. The “movement” tendency is, however, waning. Another group sees the language more as the basis for a “community” with a kind of alternative life-style. Seeing Esperanto described as a hobby still bothers some Esperantists, but I don’t think it should. On the contrary, hobbies and free-time activities should be looked at from a political angle. Hobby or not, Esperanto certainly has a political dimension. 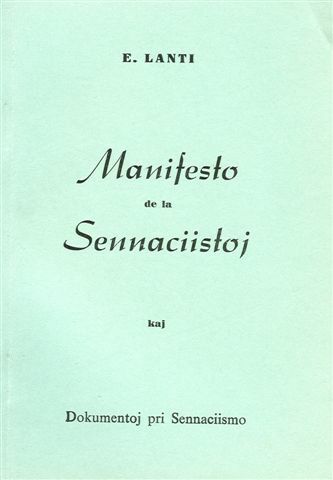 Worker Esperantists, especially those of the “anationalist” (antinationalist and universalistic) tendency in SAT, have long valued Esperanto for its capacity to inculcate in its working-class users a kind of practically oriented “proletarian cosmopolitanism” that takes them one step further away from the all-pervasive spirit of nationalism than internationalism does. Internationalism implies the existence of nations. Indeed, internationalists usually do not question the legitimacy of the national state as an institution. Internationalism does not necessarily entail antinationalism. Internationalists often harbor nationalistic views on the naturalness and worthiness of nations and the permanence and primordiality of ethno-national identities. That is why nationalists can, and do sometimes, appear in the guise of “internationalists” when it suits their purposes to look a bit “progressive”. The traditional internationalism of the workers’ movement was in any case associated with a hierarchical form of organization that didn’t make much provision for transnational grass-roots contacts among workers, and that was what SAT sought to remedy by bringing workers from as many places as it could reach into direct contact with one another and freeing them from the mental shackles of nationalism. Its ideas, and especially the ideas of its anationalist faction, were an early statement of an idea that has more recently come to be known as “globalization from below”. Anationalists – who, it must be stressed, constitute only one of several political platforms in SAT – called upon workers to refrain from any kind of national struggle and to devote themselves exclusively to class struggle. Although today the primacy of class struggle is held to question by some in SAT, the current relevance of Lanti’s warning against “national struggle” becomes apparent when one considers how often advocacy of identitarian and ethnicistic causes still hides behind a smokescreen of “antiimperialism” and “self-determination” in order to lure leftists. The bourgeois Esperanto movement is a prime example of what Lanti railed against. Large sections of it now recklessly support “ethnism”, pan-European nationalism, language purism and like causes. One of the ideas that has traditionally prevailed in SAT and that is now arguably obsolete is the idea of Esperanto becoming the universally recognized international language. Members of SAT originally shared with the bourgeois Esperanto movement the conviction that Esperanto had a good chance of “winning” the race to become the world’s main medium of communication. 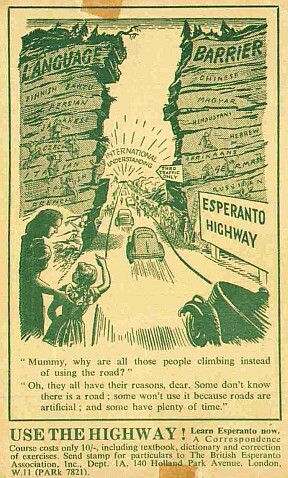 Today it would seem more prudent to treat Esperanto as a tool to promote bilingualism and multilingualism, as well as to encourage the underprivileged to adopt a more cosmopolitan outlook and life-style, than to make a dogma of the eventual triumph of Esperanto over other languages, with which it is perceived to be in competition. Opinions about this vary quite a bit both in SAT and in other parts of the Esperanto-speaking community.